It can be a nice idea to write the sentences or expressions onto cards and get the students to come up to the board and stick them where they think they go on the cline. If you are technologically minded and have access to an IWB, you could also get them to drag the expressions to the appropriate position. This exercise promotes peer collaboration and usually some interesting discussion. 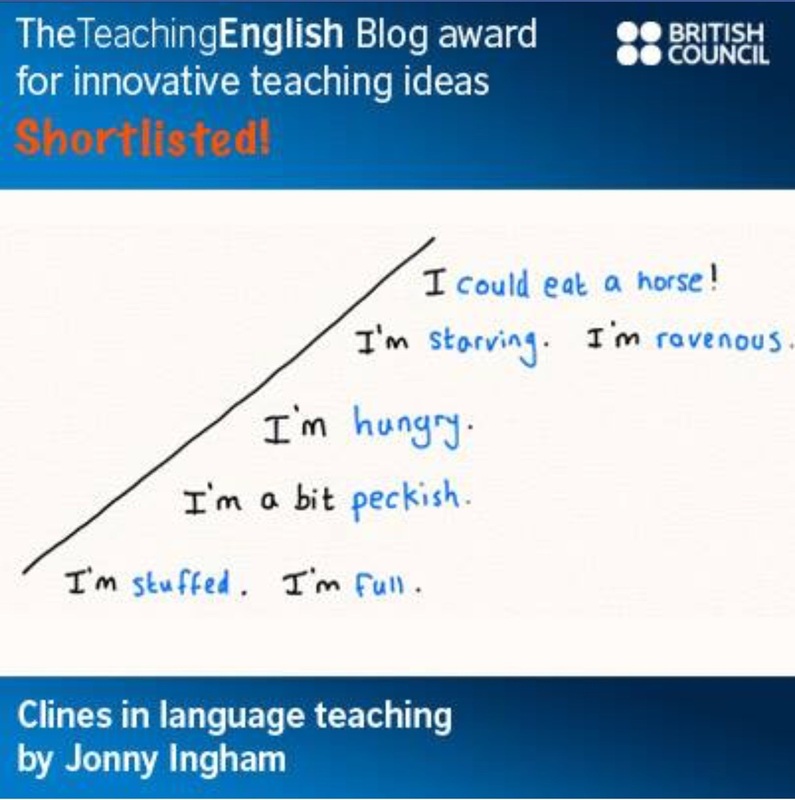 Any other ideas for using clines in class? This entry was posted in Mains and tagged #eltwhiteboard, boardwork, checking meaning, clarifying meaning, clines, EFL, ELT, grammar, language teaching, vocabulary. Bookmark the permalink. This is amazing. Thank you for such a detailed illustrations. 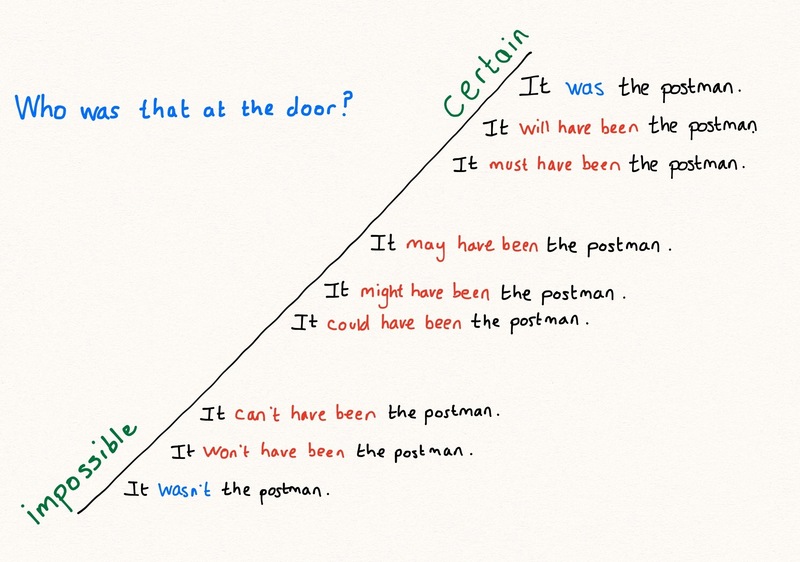 Really, logically speaking, “It was the postman.” and “It wasn’t the postman.” have the same amount of certainty (100%). The 0% end should be “I have no idea”, perhaps amplified with “absolutely”. Good point Sari, see Natália’s comments below for some discussion on this. I love it, and I really can see the use in my classes. Thanks a lot ! what’s skuffed? and what about really WAS the mailman? It’s stuffed, not skuffed! (when you are really full and have eaten too much). 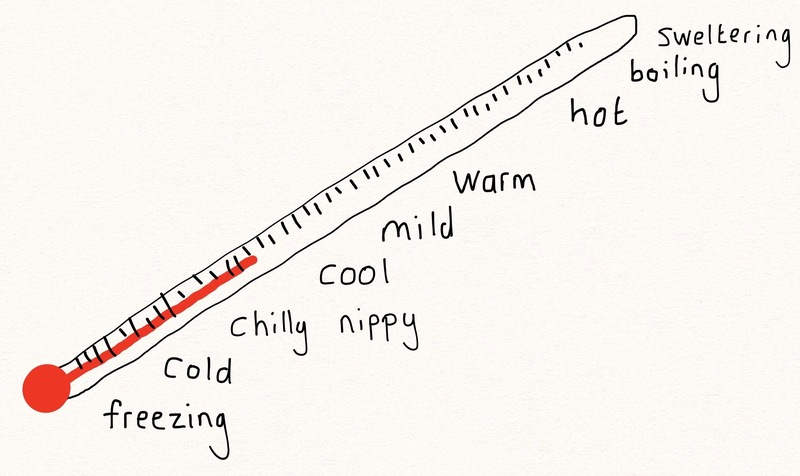 ‘It was the postman’ is on the cline, at the top, next to 100% certainty. Really nice board work and expressions. Googlefight or BNC ‘I always go to the dentist’ and ‘I never go to the dentist’ to see which expression is more popular. What is Gooflefight and BNC? This is amazing. Thank you for such good ideas. And where is the verb “to dislike”??? You mention “to hate”, “not to like”… but the easy alternative, where is it? You can add it. I think so. Thanks for your idea, though I think it is a wonderful work. Thanks for the comment Mo. I agree, you could add many more verbs such as ‘dislike’, ‘detest’, ‘loathe’, ‘am crazy about’ etc. This would of course depend on level, board space, and how complex you want it to become. I’m not so sure about ‘dislike’ though; it feels like rather unnatural usage in this context, in my mind anyway. Where I live in the US, our local paint stores have paint color samples printed on rectangular strips of heavy paper. Visualizing the clines by writing the words in order, each word on a separate color sample, already printed in light to dark order on the sample sheet, works perfectly. And the stores don’t mind you taking a batch of these color samples for free! Nice idea Billhollaway, I’ll have to get to my nearest DIY shop! Where is the ‘would have been’ situated on the cline of certainty? I haven’t added ‘would have been’ to the cline as it doesn’t express a degree of certainty. Whilst ‘would have been’ has the same form as these past modals of deduction, the meaning is very different; it expresses a hypothetical sitaution in the past, not certainty. I’d suggest changing the certainty cline, however. When I say “It wasn’t the postman”, I’m not 0% certain. Just the opposite, I’m 100%. When it comes to the difference between “It was”, “It must have been” and “It might have been, ok, it’s the certainty that varies, exactly like you put it. But when I say “It was” or “It wasn’t”, I’m just as certain. Thanks for your comment Natália. I agree. ‘It wasn’t the postman’ isn’t 0% certainty but 100% certainty as you say. I’ve never known how to visualise this on the cline however, and usually just explain this to the students. Any ideas anyone? =) You can keep the cline exactly like it is and only show affirmative sentences. Then you can add the negative versions on another parallel cline or on the same cline to the left/right. It must have been the postman – 90% – It can’t have been the postman. It may have been the postman – 60% – It may not have been the postman. It might have been the postman – 50% – It might not have been the postman. That has the added advantage of making it crystal clear that the negative of “must” is not “mustn’t” in such cases. That could work, a double cline… maybe that’s a future blog post! Thanks Natália! I was thinking about this and it might work by simply changing the label on the cline. The cline could go from ‘impossible’ at the bottom, to ‘certain’ at the top. What do you think? very useful….thank u very much. Could you explain me the difference between, really don’t like and don’t really like.Thank you!! I like it, I like it a lot, I love it! Thanks for your post, it helped me a lot. Because I’m just a student who always follows to what method suitable to me. And I wonder if you could give me some hint of how to gather the words in group (describe the same meaning with difference of certainty or shades). It is very helpful especially to teach english as second language here in Malaysia. Tqvm. Thank you Ann and thanks to everyone at Teaching English for your support. 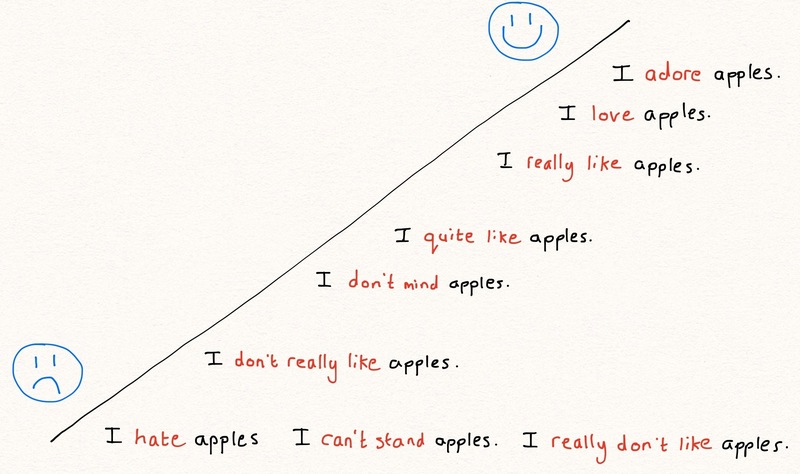 Shouldn’t ‘I like’ be there between ‘I don’t mind’ and ‘I quite like’? Yes Luay, you could put ‘I like’ there. I imagine most students are pretty familiar with this verb though! I’m going to add this to the English Teacher’s workshop program used here in S. Korea. (properly attributed, of course). You truly have created a lovely visual to help my Korean teachers of English expand both their ability to use English conversationally and convey meaning to their students. Many thanks! Thank you for your comments JD Gold. Good luck with the workshop programme. thank you ! the egs were very valuable, practical and constructive!! wow!! so easy for anyone to use. my students enjoyed using them…. very practical! Thanks for posting these! Sharing on my Facebook page facebook.com/speakenglishlive ! Very nice, I will definately use this in class. 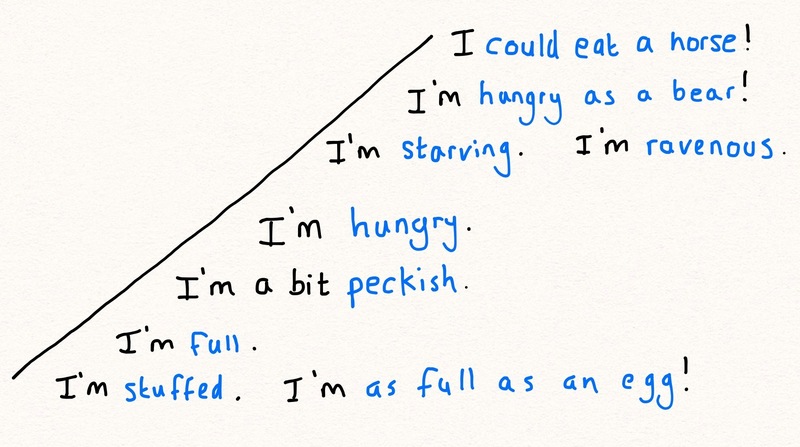 One question, though… “I’m a bit peckish”. Is there a replacement for this? I try not to teach expressions that are exclusively brittish to my intermediate students.